Mix & Match Table Lamp Base - Match with any size B Shade you like best. Made from natural Himalayan salt crystals hand mined in the Himalayan Mountains, Accentuations by Manhattan Comfort brings you a unique sphere shaped and pyramid Himalayan Salt Lamp. Perfect for Office, Bedroom, Living Room and Spa Settings. Sphere Shaped Rock is set on a natural round polished wooden base. Diameter measures 6.25" with a UL approved dimmer power cord. Heating the salt with the included bulb releases negative ions into the air, creating an effect similar to an ionizer, purifying the surrounding air. Calming Amber color is released when lamp is lit. Weight and color may vary due to the natural variation in the Himalayan Crystal Salt. Great complement to meditation routines and also makes a beautiful and unique gift. The Hampton Bay 16 in. Uplight Buffet Lamp is CSA listed and UL certified for safety and is designed to work with 60-watt incandescent bulbs (not included). The lamp is crafted from metal, features a wheat glass shade and comes in an oil-rubbed bronze finish. The beauty of this hand - cut glass mosaic table lamp comes from the golden glow from the Amber night light base. The finish is Black with a gold wash to accentuate the leaf details. Can be used as a Table and/ or night light. 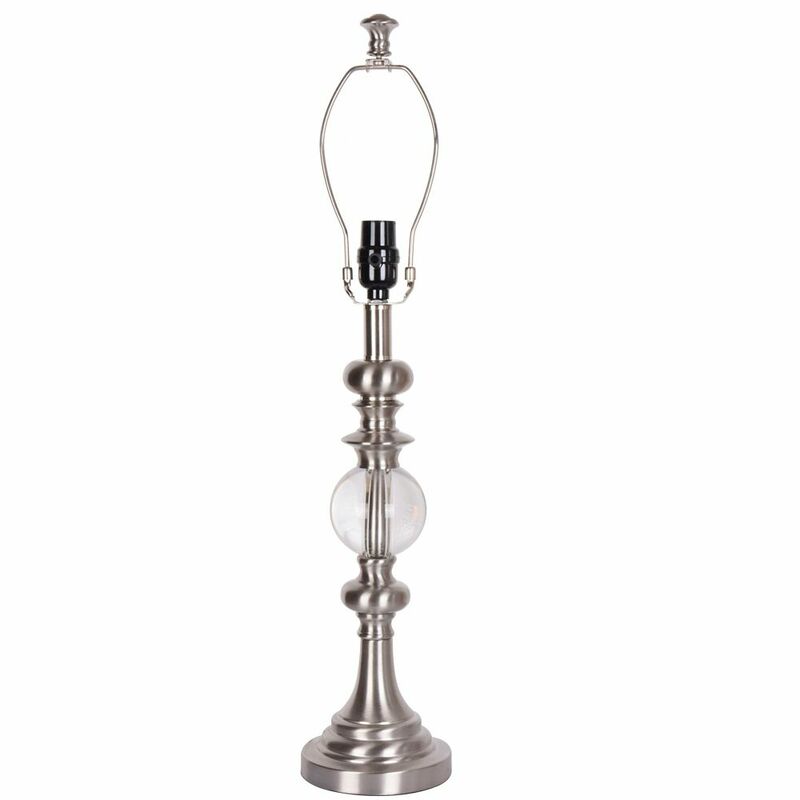 This is a grand lamp that will add elegance to any room. Be sure to get the matching Floor Lamp. Inspired by nature, this table lamp is sure to inspire your home. It comes with a scroll vine and leaf motif in a burnished copper finish.A golden taupe lampshade adds to the appeal. Crystal Sphere Table Lamp Mix & Match Table Lamp Bases & Shades allow you to create your own signature style. Choose from an array of Traditional, Contemporary, or Transitional styles. These classic bases & shades can freshen up an old lamp, or let you design a lamp for your individual style. Crystal Sphere Table Lamp is rated 5.0 out of 5 by 2. Rated 5 out of 5 by artchick from Very Classy! I purchased two of these lamp bases to go with some new silver lamp shades (that I purchased previously at another store, realizing once I got them home that they did not look nice on the bases that i had previously bought!) I returned the other bases and found these online & am glad that i did. They went perfectly with my new shades and matched my room perfectly. They are good quality, sturdy and easily compliment any room with their neutral colour. Love them.